Spain is not all Costas. It is Europe’s second most mountainous country, from the Pyrenees in the north to the Sierra Nevada in the south. In between are huge plains dotted with windmills, castles, wheat and sheep across which Don Quixote plodded on his donkey. In Andalucia, a Moorish influence is apparent in both the architecture and the food spicing. Here, you might dine in courtyards or on cool patios looking out on little white villages clinging to craggy hilltops. Over 165 million olive trees cover the plains, and around Jerez, the grape vines that bring us sherry offer a living from chalky, arid hills. In cooler weather, the Spanish huddle in restaurants known as horno asadors (‘roasting ovens’), in which lamb and suckling pig are specialities, or they head for cuevas (‘caves’), subterranean tabernas around Madrid’s Plaza Mayor, where student minstrels in traditional costume play. In summer you can snack along Barcelona’s La Rambla, while Spring in Jerez brings the opportunity to sit under tall eucalyptus trees and sample deep-fried baby eels. At night in the Santa Cruz area of Seville, take a horse-drawn carriage past whitewashed courtyards scented with orange blossom and lit by old gas lamps on your way to dine in an old mansion. 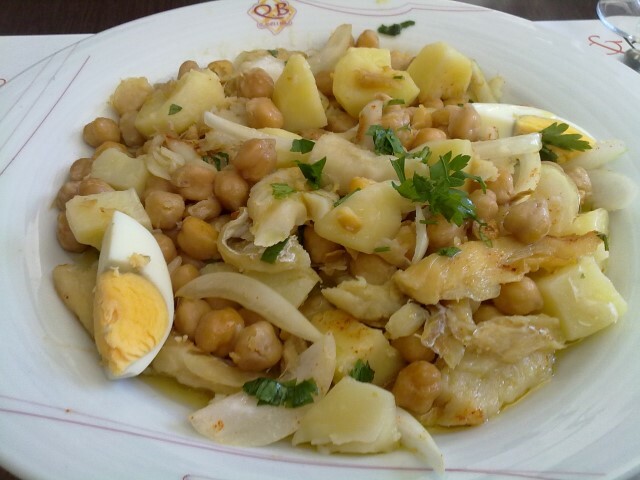 Throughout Spain, meals are often enjoyed quite late. 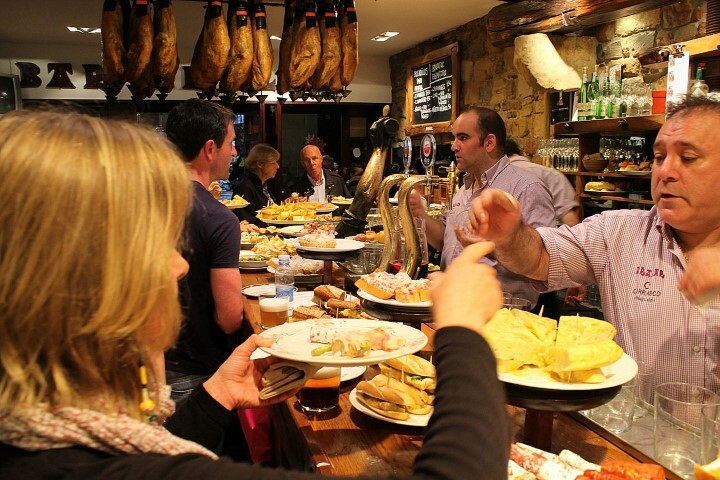 Typically, you wander out to a bar to meet friends for tapas at around 9:00 p.m., then progress to a restaurant much later. 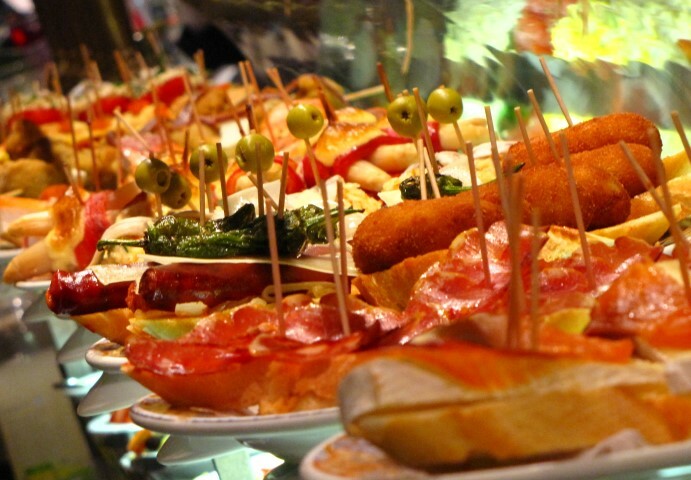 Tapas are small nibbles such as flavoured scrambled eggs (in Jerez), chorizo (sausage), ham (the best is from Huelva in Andalucia), spinach with chick peas, baby squid, fried whitebait (‘bocarones’), fresh anchovies, shrimp, mushrooms with garlic, and deep-fried meat balls. Among the best tapas areas are the narrow alleys of Seville’s old Jewish quarter and the old warehouse area of Barcelona. Bilbao and the Basque country have been influenced by proximity to France and the many pilgrims en route to Santiago de Compostella. Empanadas (meat pies), caldo gallego (a soup of greens, meats, potatoes, beans and sausage), and white-bean stews are keynote dishes. Barcelona favours zarzuelas (white fish casseroles), codfish in spicy tomato sauce, mixed shrimp or lobster with chicken, and pears with duck. Andalucia likes lots of fresh vegetables, garlic and olive oil, and kidneys sautéed in sherry. And chilled Gazpacho (the popular soup of pureed tomatoes, cucumber and bread) makes a refreshing summer lunch dish. Spain has few desserts apart from crema Catalan, a caramel-topped custard. And rice, though often used in puddings, is better known in signature dishes like paella, a big round pan of saffron-flavoured rice containing vegetables, meat or sea food. On hot days, seek refreshment in a jug of Sangria (a blend of red wine, fruit juice, and fruit with a shot of brandy), or try sparkling wines or Cavas such as Cordorniu or Freixenet. Many Spaniards take a chilled dry fino sherry as their aperitif. Main wines are the Rioja reds and Penedes from the Barcelona coast — try the red Tres Torres or white vina sol. Spanish cognac is sweeter than the French but excellent, as is inexpensive Spanish gin.